Buy the ElectraSoft Custom Fax Solution. Everything you need including an ElectraSoft USB Fax Modem. A fax solutions expert that cares about your faxing goals and will help you achieve them. Together we will get it working the way you want it to! Whether you need a dependable modem for your fax-server or just need to send a quick fax from your motel room using your laptop, call me on my direct line 1-281-499-8246, or email me. This ElectraSoft USB Fax Modem and drivers will be custom selected to work with your computer. This means that your computer, the modem, the modem driver, and the ElectraSoft fax software driver will harmonize to give you the best possible fax solution for your needs. 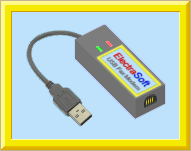 An ElectraSoft USB Fax Modem driver, that is built-in, downloadable or on CD. Depending on your Windows Operating System, I will send you the best solution for your individual needs. If you need a dependable modem for your fax-server or just need to send a quick fax from your motel room using your laptop, buy an ElectraSoft USB Fax Modem and plug it into a USB-port on your computer. 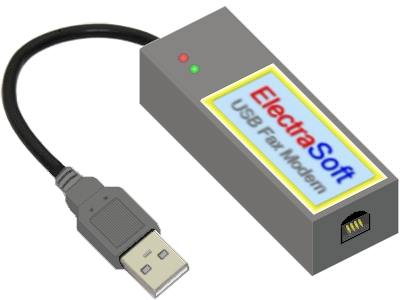 The ElectraSoft USB Fax Modem is the ideal solution for sending and receiving fax when using 32bit Fax / 64bit Fax software program by ElectraSoft or with a phone dialer like Speed Dial by ElectraSoft. Many people use the ElectraSoft USB Fax Modem for their dial-up Internet access with its powerful data and voice functions. It supports ITU V.92 protocol and can run a maximum 56Kbps downstream rate and 48Kbps upstream rate. ElectraSoft USB Fax Modem is not only compatible with industry standards, but also the upstream transmitting speed is faster than ever before. It is very easy to install and compatible with all existing modem and fax standards including G3-T4. Faxing on VOIP (Voice-Over-IP) Problem Fixed! The ElectraSoft USB Fax Modem is the best fax-modem for sending and receiving fax on the old phone lines and on the new VOIP phone lines. Today, most likely either you or the people you are sending faxes to or receiving faxes from has VOIP fax phone lines. Most fax-modems do not function dependably with the new VOIP phone lines. Years ago when the world of faxing started, it was the latest and greatest way of communicating. Now we have the Internet and email. Even our phone lines for talking and faxing are changing to VOIP. Be sure your [ElectraSoft USB Fax Modem] is not plugged into the USB port. Download the Driver that fits your Modem(SL or CX) and Windows Operating System. 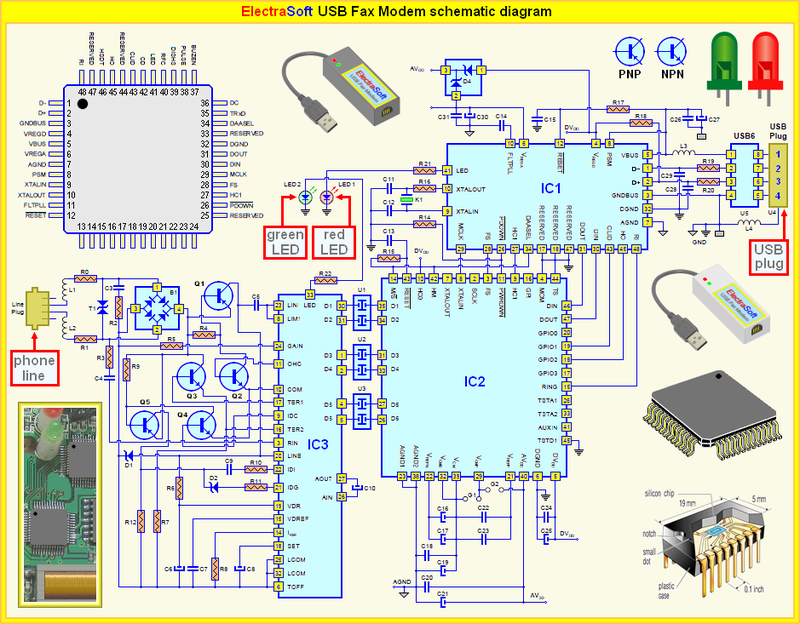 With one smooth action, Plug your [ElectraSoft USB Fax Modem] into a USB port. Wait a few seconds until the [Found New Hardware Wizard] appears. • If you have Windows 7, Windows most likely installed the right Driver and you are done. • If you do not have Windows 7, go to the [Control Pane ], [Devise Maniger], select [Modems], [USB Data Fax Voice Modem], [Properties], [Update Driver], and continue with these instructions. Select radio button (*)Install from a list or specific location (Advanced). When the [Please choose your search and installation options] windows appear, select click the [Browse] button, and browse to the conexant folder that was created when you UnZipped usbmodem.zip. In the conexant folder you will find several folders. Select the folder that best fits your version of windows. ie: If you have Windows 7-64 bit, select [Win7-64] folder. Click [OK], [Next], [Continue Anyway]. Start your ElectraSoft fax software. Click [Configure], [Modem 1], [Find ], the [Click here to find all COM-ports and modems...] button. Select the ElectraSoft USB Fax Modem. Copyright © ElectraSoft. All rights reserved.